Hello there and happy holidays to you! I know it isn’t officially Christmas yet, and also recognize that New Years seems distant, but I wanted to share something rather exciting that I have been dreaming up and designing for us this winter season. My hope by sharing it earlier rather than later is that you will have more time to weigh and consider. 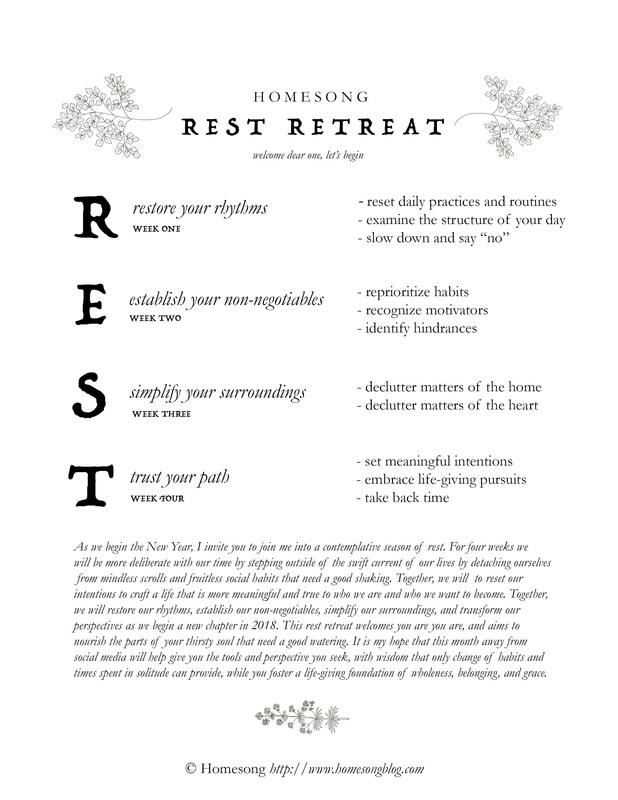 Throughout the month of January, the first new month of the year, I will be hosting a Rest Retreat here on Homesong and I invite anyone and everyone who would like to take part. For four weeks we will step outside the current of 24/7 information on social media, and instead, focus on being more intentional with our time, while devoting our energy to inner work that will help ground and center our spirits for the New Year ahead. Think of it like an mental cleanse, a rewiring of old habits that need reevaluating, and healthy opportunity to enliven your creative reserves. While her words are simple and to the point, they’re also full of truth and grounding wisdom. If we check our phones, take pictures, or refresh our screens over fifty times a day, something that is fairly normal in our current culture (and this goes for whether or not you are sharing and posting etc.) we are spending a good chunk of our one wild and precious life on a device looking down at a screen rather than up at our day. How do you start your day? How do you finish it? Is a screen involved? Perhaps that is totally fine by you and you find yourself in a good grove right now. And if so, this Rest Retreat will certainly not be your cup of tea. We all use social media (and all forms of media for that matter) for different purposes, and to assume that everyone must feel one way concerning its’ practice and management is not only silly, it’s ignorant. Use it however you feel it will best serve your needs in whatever season of life you are in, I do not judge anyone else’s experience with it. Just want to lay that out here before going forward. And I do not write this because I feel that social media is bad or the culprit of disconnect, I really quite enjoy it most days and get a lot of inspiration and support through community there, nevertheless; I venture down this rabbit hole with you because I personally know how addictive and distracting it can become if not tended to with care. I believe using social media without some restriction or self-awareness can spread like wildfire in the soul, burning up our time and energy, ultimately leaving us in a state of longing. You should know I do not plan on quitting social media forever, like I said above, it has been a beautiful gift in my life, but I do crave a break from it so I can reprioritize what I am doing with this hour and that one, and thereby give myself the gift of more time that I feel my overuse of it is responsible for taking away. Moments where we find ourselves scrolling and tapping when we could be making or learning or playing, among many, many other life-giving pursuits, can become abundant if we do not give ourselves boundaries and self-check now and again. With gentleness and grace, I offer you a chance to step outside the box of your current social media habits with me if you feel they need revisiting. My goal for this retreat is a simple one: to shake up my current rhythm concerning screen habits and put a new one into place. I am going to share my experiences with you, and hope those who join me on this retreat will feel called to the same. Some of you know that I quit Facebook and took a month of Instagram several seasons back to give myself more time to be present at home. I recognized that I was using social media far too often, and because of this, some of my relationships and priorities were suffering. It also became a crutch for me to lean on when I wanted to escape the present moment I was in or to let my mind wander. In the weeks leading up to my month long social media break, Instagram didn’t feel as inspiring and life-giving as it once had been for me. I learned the hard way, that using social media when you are down can make it really easy to fall into the trap of comparison. Using it when your intentions with it aren’t clear can make a person more self-conscious, negative, and lonely. Perhaps you know this story? However, with time off my phone and a different rhythm in place, I was able to clear my mind and a foster a new and deeper appreciation for our days together as a stay at home mom. To simply have the apps removed from my phone gave me a kind of freedom that translated into a happier and more content Amanda. Instead of reaching for my phone when I was bored, tired, looking for inspiration: I wrote, took photos for myself, spent time cooking, read more books, went on lots of walks, had play dates, and went on adventures more with my kids. It was an empowering time for me. Looking back, it wasn’t social media alone that was preventing me from filling our days with these kinds of things, but rather, it was an overall rut I had fallen into that was significantly perpetuated by the constant usage of it. In other words, social media was contributing to my feelings of inadequacy in areas of my life, where my measurement of self-worth was becoming dictated by comparing myself to the shared joy of others, and unfortunately, the venomous words of those who delighted in hurting me (albeit anonymously) for sharing bits of our lives online. A break was needed, and I in that time, I thrived. While I am in an entirely different place as to why I crave this respite away from social media, it is clear to me that it can indeed provide the rest I need. I feel the tug, so here I am. Like some of you, I am in the beginning stages of starting up new creative ventures and projects, it’s all quite exciting, and it’s my great hope that this Rest Retreat will offer me more mental space and emotional clarity, along with more opportunities to be present with my family during the break. Despite my eagerness to get the ball rollin’, I do want to share some of my concerns here with you, as I feel they may resonate and help give more transparency into the many facets of why many people continue to use social media despite needing or wanting a break from it. Social media is my main source of community and uplift these days, and I don’t know what I’ll do without the positive support and inspiration it gives me. Social media happens to be a great tool regarding social justice, and I fear that leaving it behind is a privilege and thereby goes against the resistance I am working hard to support. I love catching up on the lives of my friends and family who I do not see regularly. I will miss them and the glimpses into their days. I enjoy the creative outlet that social media is in my life, and taking that away means my creativity and self-care may suffer. Social media is how I document my and/or my family’s life right now, and without it, I fear I will no longer feel encouragement to do so. I use social media to promote my business and engagement with it is central to my career. I feel that leaving it behind, if even for a short time, will hurt what I’ve worked so hard to build it. Who can you call on for face-to-face support this month? Consider reaching out to these people before you start this retreat to let them know how much you appreciate their presence in your life. Throughout this month you’ll want to get together with some of these people, for real-time connections will fuel your energy and help restore wholeness. What other ways can I stay informed about what is going on in the world without having to log into Twitter, Instagram, or Facebook? Consider different forms of media and how you can carve out meaningful time to catch up and support issues you care about. Who’s life are you specifically going to really miss out on seeing this month? Reach out to them and see if you could have them send you photos, get together, or perhaps you have a phone date instead. Chances are, those who you are able to connect with outside of social media will greatly appreciate your willingness to be more involved in their lives. How can you infuse other types of creativity into your life during this retreat? Consider taking photos for only yourself, writing in your journal, taking an art class, learning how to sew, or doing something new with your hands. 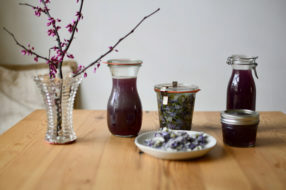 There are so many ways we can enliven our creative spirits outside of social media, and these break just might open new doors for you. How can you redirect documenting your family’s life for the time being? Consider journaling, taking photos, and printing them instead. There are many online resources for these kinds of things, but old-fashioned scrapbooking is a nice option, too. This one may be the hardest for some of you, and if you feel that social media is an integral part of your business and income, stepping away may not be an option right now. An idea you could implement would be to create a business account, if you don’t already have one, and close your personal account for the rest retreat. If you feel that stepping away for four weeks will hurt more than help your business, perhaps another kind of media fast will be more suitable. I am going to postpone partnerships and only promote companies on my blog for the meantime, but am going to keep off my social media accounts. Yes, yes, I know blogs are social tools as well, but I do not blog on my phone and it is not something that is bandaged with boredom or mindlessness. For me, this retreat aimed at getting me off my phone and into more life-giving pursuits, this blog being one! I will continue to write and share here, but my participation on social media apps will be taking a break. What will the Rest Retreat Look Like? It will last four weeks, and each week we will tackle on a new letter from the word REST. Week One: Restore your rhythms | This week will focus on reseting the daily practices and rituals in your life, examining the structure of your day and how you desire it to change, and learning what it means to slow down while practice saying “no” and honoring boundaries. Week one will lay the foundation for how you choose to spend the time during your retreat, and with it, will help restore the rhythms in your life. Week Two: Establish your non-negotiables | This week will focus on reprioritizing the habits you currently practice, recognizing what types of things motivate you (internal vs. external), and identifying the hindrances that you feel are for holding you back in life. Week Three: Simplify your surroundings | This week will focus on decluttering areas of the home and the heart. It will be a week of purging items that no longer bring you utility or joy. 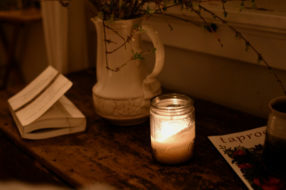 Editing and paring down to the essentials in spaces you live and love will wipe slates in your life clean and give you room to set new life-giving intentions. Week Four: Trust your path | The final week of this retreat will focus on setting meaningful intentions for your life, embracing life-giving pursuits that make you feel more whole, and taking back time with an empowering attitude that puts you in charge of writing your story and drawing the lines of your path. 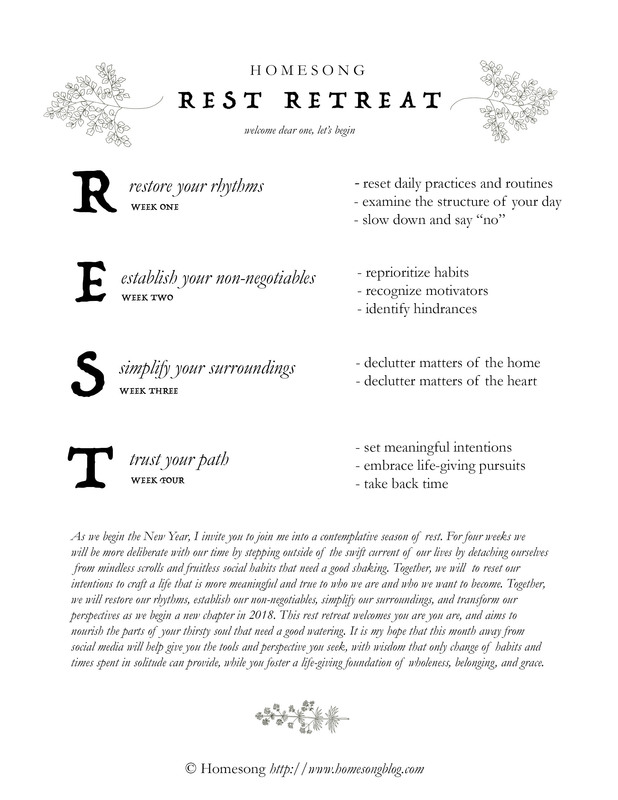 You can expect a Rest Retreat post every Monday morning in January where I will post writing prompts, practices, meditations, and related reading material connected to our focus. I believe in the power of accountability, and we because we will be on this journey together, this space will be a nonjudgmental space where you can share your experiences and how the retreat is either positively or negatively affecting your life. And lastly, why Rest? Well, this is where I am going to let you fill that in. Why do you think the word Rest applies? What does the word Rest mean to you? How do you think this Rest Retreat could help you start of the New Year? Who’s with me? I am excited to begin! This is much needed. I have taken breaks in the past but they don’t last for long. I needed a gentle nudge/accountability to do this again yet with more intention. Thank you for leading the path. Thank you for sharing this! I find myself down the “rabbit hole” of comparison far more that I care to admit and that kind of thinking isn’t good for the mind or soul. I look forward to the retreat in January! This has been on my mind for a long time now. I am in. Great timing for this in my life! Question, is there a way to make the graphic at the top a printable PDF? I would love to post this to remind myself of the intentions. Hello Amanda. I’m with you 100% I have needed this gentle nudge for a while now, thank you. I identify with much of what you have noted here and I am looking forward to switching off and living more in the moment. I would like to focus my free time on reading, practising my photography just for my own pleasure and baking with my little ones. Your idea of a rest retreat was serendipitous. I’ve been concerned about my time online and the negative impact it’s having on my ability to live according to my values and to explore the real world around me. That concern was heightened recently after reading about the impact constant screen time has on dopamine, desensitizing us to its effects, pushing us to more mindless surfing. Time to make changes. Thank you for your vulnerability and the invitation. I am SO down to do this. I will be sharing this post with a couple of my close girlfriends and my husband as well because I know they will greatly benefit from this as well. SUPER DUPER excited! Cheers to a great refreshing start to the new year. Hi Amanda, I Love this idea of stepping back and finding comfort in our offline daily lifes. Is there a possibility to Print that beautiful page at the beginning? I Would Love to Pin this in my bedroom or kitchen just to read it several times a day! Trank you so much for sharing your beautiful and kind thoughts! I am SO excited about this! Could not have come at a more perfect time as I constantly take facebook on an off my phone, crave more than social media inspiration, and am reading “Whispers of Rest” a devotional! I am a big fan of your beautiful blog and always enjoy your articles. I have to say that I’m very excited by this one and cant wait to join in the REST. Thank you to all the nard work and thought that you put into sharing your life and ideas with us. Merry Christmas! ‘Have been looking forward to this. Just finished watching your Live IG Story about it. Since you mentioned we’d be talking about stuff here at the end of each week, I was wondering if it might be possible to add any sort of ‘subscribe to comments’ notifications feature, here on the blog, so we can know if anyone replies to our comments and be able to participate in the great conversation better. Thank you for doing this and considering the idea. As a visual person, I find social media a great source of inspiration. I love seeing what other creatives are making and how they are making it, and social media makes it so easy. On the other hand, I hate being addicted to it. It’s the first thing I do when I wake up in the morning and the last before going to bed at night. I hate that it makes me feel as if my life is less “perfect” than the life of complete strangers on the internet, and I hate that I know all this yet I fall into the trap every single time! I am a full time student and I have noticed that social media effects my study in two ways – it’sis a major source of distraction, and it makes me dread studying because I see everyone else having fun on Instagram while I have to spend most of my day poring over books. This is just what I need to start my 2018 off right. This is just what I need to kickstart my year! Wow. I can surely relate to ALL the above. I am excited to join in & be apart of this wonderful community. Thank you for being bold & honest. I cherish it.